New York 2014: Dezeen style editor Dan Howarth picks his top five designers and studios not to miss at New York's Sight Unseen Offsite exhibition, which opens today. Coinciding with New York's festival of design this week, the Sight Unseen Offsite exhibition will showcase products by local and international designers at 200 Lafayette Street in Manhattan. 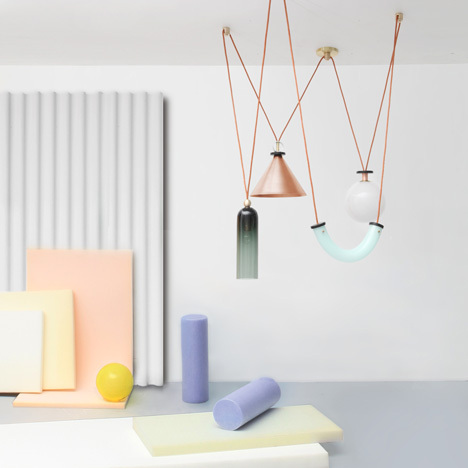 Designers Dylan Davis and Jean Lee, founders of US atelier Ladies and Gentleman studio, are showing lighting pieces with pendants in mismatched materials including copper and coloured glass. The Shapeup pendants hang at different heights from a single cord that zigzags up and down from the ceiling, sometimes interspersed with weights. Brooklyn studio Moving Mountains is displaying simple designs including the wooden A-Framed Mirror, painted bright orange on the back, and a pair of lamps with engineered marble bases and slender powder-coated steel stems. Both Aspect lamps have pivoting conical shades, but the floor lamp has a straight stand while the desk version curves over. The 1980s Memphis style revival we spotted in Milan last month has been transported across the Atlantic, and can be seen in Swedish designer Jenny Nordberg's series of clocks made from blocky geometric forms and patterned with speckles. One of the timekeeping devices – which are from her Omkompositioner collection – incorporates candle sticks, while another has an egg-shaped element balanced on top. Following a recent flurry of new wallpaper designs, Brooklyn-based Calico Wallpaper has created a collection of gradated designs that blend cool and warm tones, titled Aurora. The effects were developed by suspending mineral pigments in liquid then transferring them to linen fabric by hand. Finally, the monochrome Neo Laminati pieces by New York collective Kelly Behun Studio will be difficult to miss. Bold black and white stripes are digitally printed onto seating and tables formed from perpendicular and 45-degree-angled planes. The designers took influence from a variety of 20th century design movements – including Memphis, again. The design fair is organised by online magazine Sight Unseen, founded by design journalists Jill Singer and Monica Khemsurov who set up the NoHo Design District that took place for the previous three years as an alternative to the International Contemporary Furniture Fair (ICFF). Sight Unseen Offsite continues until 20 May.